To perform panoramic hysteroscopy, the uterine cavity, a virtual cavity, should be expanded with an appropriate distending medium. Because of the thickness and resistance of the uterine walls, distention requires positive pressure. Three media can be used: carbon dioxide (CO2) gas; low-viscosity fluids with or without electrolytes; and high-viscosity fluids, such as dextran. CO2 gas is the cleanest medium because its refractory index permits the best visualization when no interfering blood or bubbles are present. It is best used with small-caliber (outer diameter [OD] less than 5 mm) diagnostic hysteroscopes, which do not require cervical dilatation. The CO2 gas is delivered at a rate of 40–60 mL/min with an intrauterine pressure of no more than 100 mmHg (Fig. 1). These evaluations are usually performed in an office setting and usually can be accomplished in less than 5 minutes. With CO2 gas, any manipulation of the endometrium, including uterine sounding, should be avoided so as not to traumatize the tissue before exploration begins. Fig. 1. Hysteroflator for CO2 gas uterine distention (Storz). Low-viscosity fluids with or without electrolytes are used with operative hysteroscopes because they allow uterine washings to remove the debris (blood clots or small amounts of blood) usually produced during cervical dilatation and intrauterine surgery. Low-viscosity fluids containing electrolytes, such as normal saline, dextrose 5% in half normal saline, or Ringer's lactate, are most useful and practical when operating with mechanical instrumentation or using fiberoptic lasers because these two modalities lack conductivity. 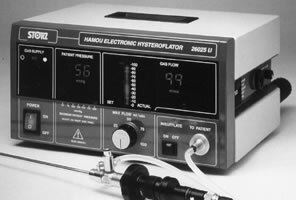 When the resectoscope is used with electrosurgery, only fluids without electrolytes should be employed. These are dextrose 5% in water, glycine 1.5%, sorbitol 3%, and mannitol 5%. They permit use of electrosurgery and avoid conductivity, decreasing the chances of damage to surrounding structures and providing effective and controlled energy to the treated areas (Fig. 2). High-viscosity fluids, such as dextran and, specifically, Hyskon, a 70,000-molecular weight dextran in 10% dextrose, can be used during operative hysteroscopy, particularly when visualization is impaired by bleeding or difficult dissections. This viscous solution does not mix well with blood and, due to its thickness and viscosity, requires only small amounts to be instilled in the uterine cavity during surgery. Hyskon is nonconductive, does not contain electrolytes, and though useful when using mechanical instrumentation or lasers, it is somewhat cumbersome with electrosurgery, specifically the resectoscope. The washing effect of the instrument is lost due to the viscosity of the substance. Furthermore, Hyskon caramelizes around the electrodes, requiring their frequent replacement. Fig. 2. 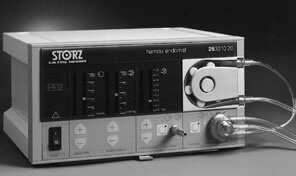 Endomat for uterine distention with liquid media (Storz). Whatever method is chosen for hysteroscopy, the properties, qualities, and drawbacks of each substance should be considered. Complications related to excessive amount of fluid intravasated during operative hysteroscopy can be avoided by careful monitoring of the quantity of fluid infused and recovered. Measuring the amount of nonrecovered fluid, which in all probability has been intravasated, alerts the operator to possible fluid overload. Most diagnostic hysteroscopes of less than 5-mm OD do not provide adjacent channels for operations, and are strictly for diagnostic use. Continuous flow systems have been successfully adapted to small-caliber hysteroscopes, however. Therefore, liquid media can be used with these endoscopes, also permitting the performance of some surgical procedures. The operative hysteroscopes are larger and usually have a 7- to 8-mm OD and a 7-French operating channel to introduce instrumentation, usually of the semi-rigid type when mechanical instruments are used. Alternatively, fiberoptic lasers can be introduced through the operating channel, as well as polyethylene catheters to wash from the cavity the debris, blood clots, or mucus that interfere with visualization (Figs. 3, 4, 5, 6, 7, and 8). Fig. 3. 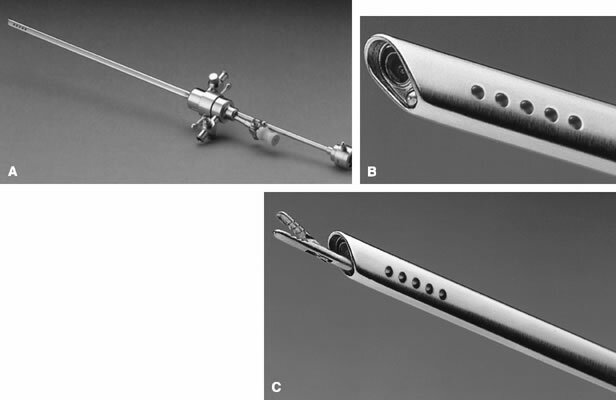 Diagnostic hysteroscope: 4-mm diameter telescope (top), 5-mm diameter sheath (bottom) (Olympus). Fig. 5. Diagnostic sheath 3.8-mm diameter (top). 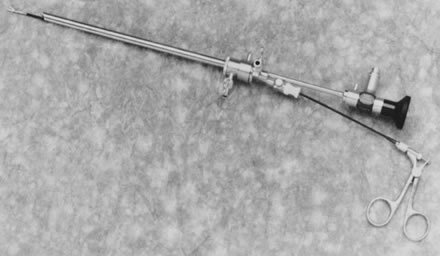 Assembled diagnostic hysteroscope: a 2.8-mm, 25° angle view telescope encased in a 3.3-mm diameter sheath (bottom) (Wolf). Fig. 6. A. Operating sheath of small caliber hysteroscope with distal perforations for outflow (Storz). B. Distal end of continuous-flow hysteroscopic operating sheath (3.9 × 5.9 cm OD) (Storz). C. Distal end of small caliber-hysteroscope with a 5-French grasping forceps in place (Storz). Fig. 7. Flexible diagnostic hysteroscope, 3.3-mm diameter, with rigid roedial portion to facilitate introduction and operation. (Fujinon). Fig. 8. 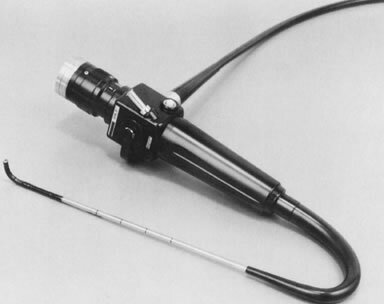 Assembled operative hysteroscope with flexible scissors in place (Storz). Additionally, because cervical dilatation is avoided, minimal or no anesthesia is required to perform hysteroscopic procedures in the office setting. Therefore, paracervical block anesthesia with 3–4 mL of a local anesthetic, such as chloroprocaine hydrochloride 1% (Nesacaine), will be sufficient to abolish any discomfort for the patient. Furthermore, the need for analgesia is also markedly reduced. Hysteroscopy can be performed using larger operative hysteroscopes (7-mm OD) under local anesthesia; however, with a paracervical block, the need for cervical dilatation requires a larger amount of anesthetic to be infiltrated superficially in the paracervical areas (base of the uterosacral ligaments) with 8 to 10 mL of the solution. In these situations, however, the procedures performed should be expedited and confined to minor surgical procedures. Extensive dissections or procedures using the resectoscope are better performed under regional, spinal, or general anesthesia. The resectoscope provides inflow and outflow channels by a mechanism of assembling two concentric sheaths of 8- to 9-mm OD. The rectoscope permits the use of electrodes such as the loop to resect, or the rollerball or rollerbar to coagulate; additionally, electrical knives are available to cut thick structures, such as uterine septa or adhesions (Figs. 9 and 10). Fig. 9. 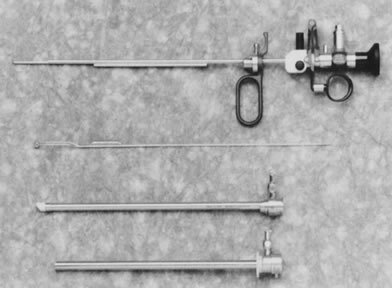 Unassembled gynecologic resectoscope (top to bottom): telescope with spring-loaded bridge, coagulating electrode, inner sheath, and outer sheath (Storz). Fig. 10. Assembled gynecologic resectoscope with wire-loop electrode in place (Storz). Most hysteroscopes have a 4-mm OD telescope with a foreoblique (30°) angle of vision to permit visualization of the uterotubal areas. The resectoscope has a 12–25° foreoblique view, most useful in obtaining a good visualization of the working electrode as it is moved forward by a spring-loaded mechanism. High-intensity xenon light is most useful, particularly when using video cameras. Video cameras with high resolution and magnification simplify hysteroscopic evaluation and surgery, providing excellent resolution, comfort to the operator, and the ability to share the procedure with the operating team. The findings and results can be shared with the patient (Figs. 11, 12, and 13). Fig. 11. 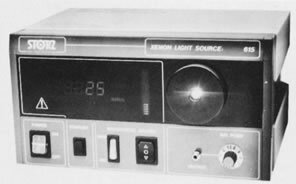 Xenon light source for endoscopy and video recording (Storz). Fig. 12. 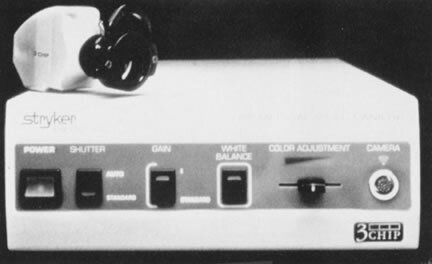 Three-chip video camera (Stryker). Fig. 13. 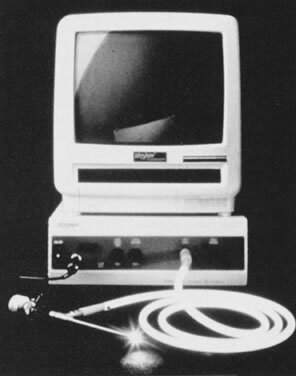 Endoscopic video camera and video screen unit (Stryker). The hysterosalpingogram is a practical method to evaluate the uterine cavity and the fallopian tubes. Its accuracy has been challenged, however, particularly for false-positive results, usually due to air bubbles, blood clots, debris, or distortion of the uterine cavity during the examination. This problem can be compounded by the dye chosen for the examination and the performance of hysterosalpingography.6 When patients with abnormal hysterosalpingograms have been evaluated by hysteroscopy, a 30% rectification of the abnormal hysterosalpingogram has been reported.7, 8 For this reason, when the hysterosalpingogram is abnormal, it is important to add endoscopy to confirm or rectify the abnormal hysterographic findings. This evaluation not only provides more accurate diagnosis, but also offers the opportunity for direct treatment under visual control. A submucous myoma may be diagnosed and treated hysteroscopically, a polyp may be located and removed, adhesions confirmed and treated, and a symptomatic uterine septum divided (Tables 1 and 2). 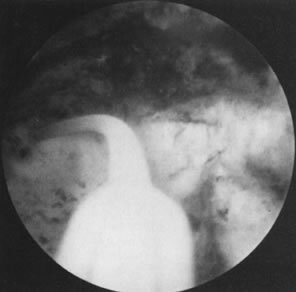 *Normal hysterograms; only 30 confirmed. The hysterosalpingogram can provide information about other areas that hysteroscopy cannot, for example, tubal lumen symmetry, suspicion of salpingitis isthmica nodosa, diverticula, normal or abnormal tubal epithelial folds, and tubal patency. Hysteroscopy and hysterosalpingogram are not exclusive of each other but are complementary, and should be used as such. Because hysterosalpingography is easier to perform and interpret than hysteroscopy, less expensive, and provides valuable information about the uterine cavity and fallopian tubes, it should continue to be the first line of investigation in the evaluation of the infertile woman. Hysteroscopy should be used to assess the normal hysterosalpingogram to rectify or confirm previous abnormal hysterographic findings (Table 3).9, 10, 11, 12 The atraumatic introduction of the diagnostic hysteroscope through the endocervical canal provides an excellent method for evaluating this previously inaccessible area. Scars can be ruled out, as can structural abnormalities of the endocervical folds and glands, and adhesions or stenosis of the internal cervical os. The cornual regions of the uterus and the uterotubal junctions have been difficult to evaluate without direct visualization. Adhesions, small polyps acting like valves, sometimes occlude these areas, which can be thoroughly explored by direct visualization. These anatomic lesions can be treated concomitantly (Figs. 14, 15, 16, 17, 18, 19, and 20; Color Plate 1A and B). Fig. 14. 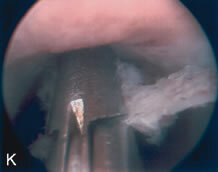 Hysteroscopic view of endocervical canal at insertion of hysteroscope. Fig. 15. Endocervical canal as the endoscope is advanced. Typical endocervical rugosities are seen. Fig. 16. 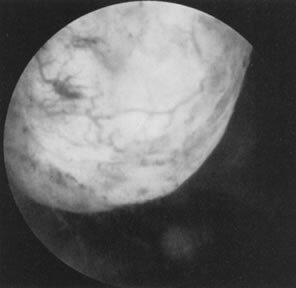 Hysteroscopic view of a normal uterine cavity in early follicular phase. Fig. 17. 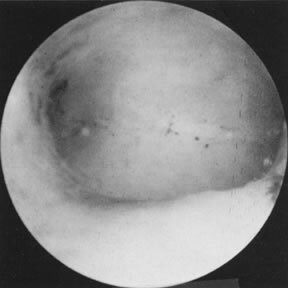 Hysteroscopic view of uterine cavity in secretory phase. Fig. 18. 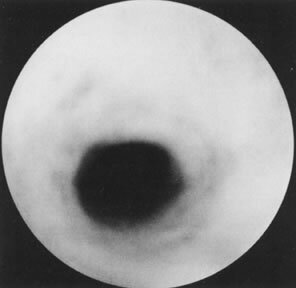 Hysteroscopic view of submucous leiomyoma. Peripheral vascularization throughout an atrophic endometrium is seen. Fig. 19. Sessile endometrial polyp in right, posterior-superior aspect of uterine cavity. Fig. 20. A broad complete uterine septum seen from the internal cervical os. Color Plate 1. A. Panoramic view of endocervical canal. Plicae palmatae and glandular openings can be seen. B. 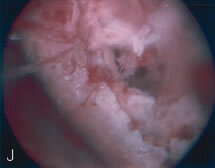 A pedunculated submucous myoma and several endometrial polyps in a patient complaining of abnormal uterine bleeding. C. Submucous myoma on right cornual region. The fallopian tube is free. D. Marked vascularization and microhemorrhages in a patient with chronic endometritis. E. Thick adhesion between uterine walls before treatment. 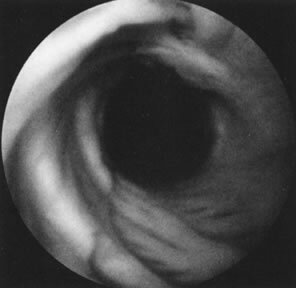 F. Hysteroscopic view showing bubbles from liquid distending medium being aspirated with polyethylene catheter. G. Hysteroscopic view of large fibrous polyp occupying large portion of uterine cavity. H. Partially embedded Lippes loop intrauterine device before removal. I. 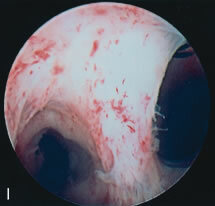 Complete uterine septum involving a portion of endocervical canal. 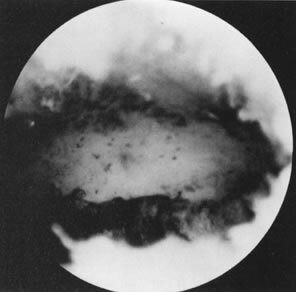 J. Hysteroscopic view of osseous metaplasia plaques at the uterine fundus. K. Removal of osseous metaplasia fragments under hysteroscopic control. The evaluation of patients with unexplained infertility requires meticulous attention to details of all the basic methods for evaluating infertility, reassessing the normalcy of reproductive anatomy. These patients frequently require a laparoscopy, which should be accompanied by hysteroscopy. Even a minor abnormality that may not completely explain the infertility should be treated. The narrow diameter of this area (less than 0.5 mm) makes this method difficult, as compared to tubaloscopy from the fimbriated end, which benefits from the larger diameter of the tube, as well as the possibility of fluid distention and continuous washing. Nonetheless, this method of tubal evaluation continues to be pursued and remains a promising technique. There are several methods to treat the uterine septum hysteroscopically. In the most widely employed method, mechanical semi-rigid scissors are used to divide the septum systematically until reaching the junction between the fibrotic septum and the myometrium. This is done by following the symmetry of both uterine tubal openings, and observing by hysteroscopy the rich myometrial vascularization of the area, and by laparoscopy the uniform translucency of the hysteroscopic light. Patients are given prophylactic antibiotics, using cephalosporins with 1 g of cefazolin sodium (Kefzol) intravenously during the procedure followed by cephalexin (Keflex) 500 mg by mouth four times daily for 3–4 additional days. Estrogens are given in the form of conjugated estrogens (Premarin) 2.5 mg twice daily for 30 days, and progesterone in the form of medroxyprogesterone acetate (Provera) 10 mg in the last 10 days of this artificial cycle to allow withdrawal bleeding. At the completion of hormonal treatment, a hysterosalpingogram is performed to assess the results of the hysteroscopic treatment; if satisfactory, the patient is allowed to conceive. Modified from Siegler AM, Valle RF: Therapeutic hysterocopy procedures. Fertil Steril 50:685, 1988. 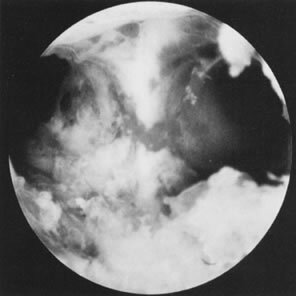 The best screening method to rule out intrauterine adhesions is hysterosalpingography. 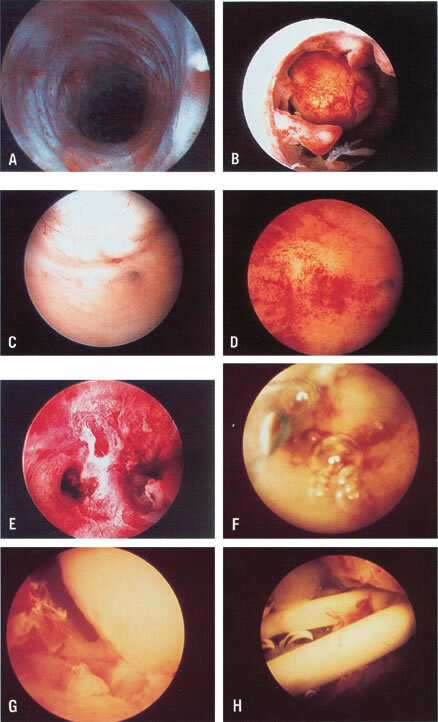 Hysteroscopy will confirm the presence of adhesions, evaluate the type of adhesions, and serve to divide these adhesions under visual control (see Color Plate 1E). A 7- to 8-mm OD operative hysteroscope is used, with semi-rigid scissors and biopsy forceps to systematically divide the adhesions. Concomitant laparoscopy is used when extensive adhesions are present and when tubal occlusion is demonstrated on the hysterosalpingogram, as a guide to the hysteroscopic surgery. Perioperative and postoperative antibiotics are usually prescribed in the form of cephalosporins with 1 g IV during the procedure, followed by cephalexin 500 mg orally four times daily for 5–6 days, particularly in women requiring an intrauterine splint after the surgery. Adjunctive hormonal treatment to stimulate re-epithelialization is used with conjugated estrogens, Premarin 2.5 mg orally twice daily for a 30- to 40-day cycle, with additional terminal progesterone as medroxyprogesterone acetate, 10 mg once a day in the last 6 to 10 days of this artificial cycle. At the conclusion of the hormonal therapy, a hysterosalpingogram is performed to evaluate the results of this therapy. To determine the prognosis of the treatment, a three-stage classification of the adhesions (mild, moderate, and severe) is used based on the extent of adhesions seen on the hysterosalpingogram and the type of adhesions involved as determined by hysteroscopy. Mild adhesions are usually filmy adhesions composed of basalis endometrium; they partially or totally occlude the uterine cavity. Moderate adhesions are composed of fibromuscular tissue covered by endometrium; they usually partially or totally occlude the uterine cavity, and bleed on division. Severe adhesions are composed of connective tissue. They usually do not have endometrial lining and may partially or totally occlude the uterine cavity.30 The restoration of normal menstruation is achieved in about 90% of the patients treated. The reproductive outcome parallels the extent and type of adhesions. The milder the adhesions, the better the prognosis. Older adhesions that more extensively occlude the uterine cavity have a poorer prognosis. Valle and Sciarra30 reported on 187 patients evaluated and treated by hysteroscopy with restoration of normal menstruation in 88.2%. The reproductive outcome correlated with the type of adhesions and extent of uterine occlusion, and ranged from a term pregnancy rate of 81.3% in patients with mild disease to 31.9% in patients with severe disease. Although early diagnosis and treatment of intrauterine adhesions seem to improve prognosis, the therapeutic outcome after hysteroscopic division of adhesions has surpassed any blind treatment, adding precision in the re-establishment of normal symmetry to the uterine cavity, and avoiding unnecessary trauma to the rest of the endometrium (Table 5). Although benign tumors of the endometrium or the muscle seldom cause infertility, those located in the uterine cavity may interfere with nidation or appropriate growth and development of an established pregnancy. Polyps may be removed accidentally at curettage or exploration with forceps. To establish a definite diagnosis and location of a polyp, hysteroscopy is mandatory. 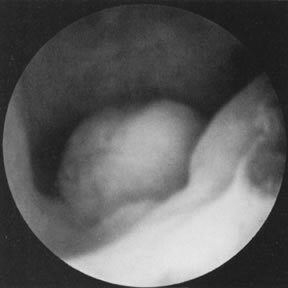 Assurance that the polyp has been removed completely can only be offered by the hysteroscope, however (Fig. 19). Modified from Siegler AM, Valle RF: Therapeutic hysterocopy procedures. Fertil Steril, 50:68, 1988. About 30% of infertile women have fallopian tube obstructions causing infertility. Although 10–20% of women demonstrate cornual tubal occlusion in their evaluation by hysterosalpingography, many of these occlusions are due to physiologic tubal spasms and must be evaluated by laparoscopy under general anesthesia.13, 14, 36, 37, 38 In a significant number of patients with cornual tubal occlusion demonstrating occlusion at laparoscopy, no fibrosis is found on microsurgical tubal reconstruction, only obstruction by debris or proteinaceous material plugging the tubal lumen. In fact, Sulak and coworkers39 described an amorphous material present in the tubal lumen at histopathology in 6–18 (33%) patients operated for proximal fallopian tubal occlusion. Three patients (17%) had tubes with normal anatomy and no occlusion. Seven of eighteen patients (39%) had tubal occlusion by fibrosis or salpingitis isthmica nodosa on histopathological evaluation: Over 50% of patients who had surgery and underwent histopathological evaluations demonstrated pseudo-occlusions or obstructions produced by debris or thick mucous tissue. For these reasons, tubal cannulation, begun in the late 1960s and early 1970s, was revived in the early 1980s.40, 41, 42, 43, 44 Better, softer, and thinner catheters were introduced by manufacturers based on experience with angiographic techniques using coaxial catheters, and tubal cannulation was made easier, safer, and more reproducible.39 The important elements in this procedure are a 3-French soft catheter with a soft wire-guide of less than 0.5 mm diameter. A 5-French co-axial catheter can be used to guide these two elements. The procedure should be performed in the early follicular phase when the endometrium is thin and no significant debris is present in the uterine cavity. Concomitant laparoscopy is used to assess tubal patency and to aid in the cannulation procedure. The wire guide is passed into the tubal lumen and the 3-French catheter then is guided over the wire guide, bypassing the intramural portion; the wire guide is removed and indigo carmine is injected directly through the 3-French catheter. An assistant using the laparoscope assesses tubal patency. Patients who fail tubal cannulation are candidates for microsurgical tubal reconstructions on the assumption that the occlusion is fiberoptic. Patency after hysteroscopic tubal cannulation is 72–92% and intrauterine pregnancy approaches 50%.43 Most tubal cannulations can be performed using the rigid hysteroscope. The new flexible operating hysteroscopes, which are steerable and can be directed toward the uterotubal cones, are particularly helpful in small uteri with deeply recessed uterotubal cones (Fig. 21; see Color Plate 1C through G) (Table 7). Fig. 21. Hysteroscopic tubal cannulation of right fallopian tube. *15 patients refused additional procedures. Ultrasonography is also valuable in evaluating the response of leiomyomas to medical treatment, specifically GnRH analogues, because these medications decrease the size of the leiomyoma, particularly after 3 months of administration.35 Combining the three methods of evaluation complements the overall evaluation of the uterus, and is especially valuable in the presurgical evaluation of uterine leiomyomas. Uterine factors account for less than 10% of all infertility. The hysterosalpingogram has been the most useful method of evaluation as the initial screening test. Because of the high false-positive yield of the hysterosalpingogram, hysteroscopy becomes a valuable adjunct in the evaluation of patients with abnormal hysterograms, permitting an accurate diagnosis and sometimes direct treatment. Hysteroscopy is used as a therapeutic method in many conditions that may affect fertility, such as symptomatic uterine septum, intrauterine adhesions, endometrial polyps and submucous leiomyomas, and cornual fallopian tube occlusion. The addition of ultrasonography complements the overall evaluation of the uterus and in selected patients becomes a useful adjunct to infertility evaluation. The main indication for hysteroscopy in infertile patients is the abnormal or ambiguous hysterogram. In conjunction with hysterosalpingography, it adds accuracy and precision in the evaluation of uterine cavity and endocervical canal, ruling out factors that may affect fertility.